I stopped off at Belmont Station the other night. It's one of my favorite places. My timing was a little off. You may recall hearing that tickets for Pliny pours sold out in 22 minutes. Well this was one of the days on which they were exchanging pours of the Younger and Elder for tickets. The place was busy, not packed. I didn't have any Pliny tickets. Lisa Morrison, Beer Goddess and co-owner of the joint, stopped by to redeem a ticket. She kindly offered me a taste of the Younger. Not bad, I thought, but definitely not worth the hype surrounding it. I resumed my drinking/tasting. My habit at Belmont Station is to order glasses (as opposed to pints) of the most interesting beers on the tap list, which is usually pretty good there. That way I get to taste a few great beers without having to stumble out of the place. At one point, I needed to use the restroom. 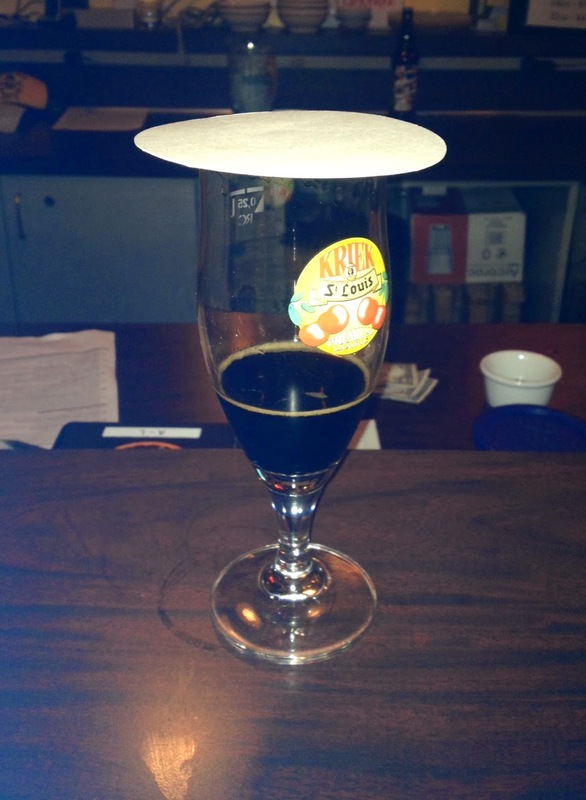 Since the place was relatively busy and I wanted to keep my seat at the bar, I put a coaster over my beer. That's the universal signal for "Please don't disturb my beer" and "This seat is taken." When I returned a few minutes later, I found a young gent glued to my seat and another gent wedged in next to him against the bar. I guess traditional bar etiquette may be lost on the younger generation of craft beer drinkers. That's not the only thing that's lost, but never mind. The incident reminded me of a story Morrison shared with me when I was interviewing her for my book about a year ago. This was one of many Don Younger stories I heard. Few made the book, sad to say, due to the contractual word count limit. This one involved something that happened when he was at the Great American Beer Festival in Denver in some unspecified year. When Don went to the GABF, he evidently didn't hang out much in the frat hall. He knew a lot of people in the business and liked to spend time drinking and partying with them. So he would visit his favorite places in Denver and hang out with friends..
On this particular occasion, Younger was at the Falling Rock Taphouse, a joint patterned after his own Horse Brass. Sitting in his designated seat drinking (and surely chain smoking), his throat started to bleed where he'd had an incision (apparently a tracheotomy). Younger got up, put a coaster on top of his beer and announced he was going to the hospital to have his throat taken care of. "I'll be back," he told them. When he returned a few hours later, his beer was gone. "What happened to my beer?" he wondered. "I told you I was coming back." No one had an answer and he wasn't happy. Back to Belmont Station. I didn't make a big deal about the gents who commandeered my seat. I reached between them and grabbed my beer. I told them I didn't mind standing. "I've been sitting most of the day," I said. Which was true. The point is, if you see a glass with a coaster on top of it, leave it alone...and assume the empty seat or stool is only temporarily vacant. Perhaps we should call it the Younger Rule. "The Younger Rule" - I like it. Good for you and politeness; you can probably guess I would have been...well...at least a little less polite. This holds true almost everywhere but beware it is not universal! There are some regional holdouts (Wisconsin comes to mind, but I know there are more) where a coaster on the drink means you're done. I came for a party here last night and it was fabulous. They have added the intermezzo in between meals for guests to clean their palates as well as a dessert and candy table for everyone to enjoy.